The most beautiful sights of West Iceland are featured in this popular day tour. We drive through Hvalfjörður fjord to the Borgarfjörður district where we’ll visit Deildartunguhver, Europe’s most powerful hot spring. We drive further inland to the Hraunfossar and Barnafossar waterfalls and on through the Húsafell woodlands. At Húsafell we leave the main road and take the highland trail to Iceland’s second largest ice field, Langjökull glacier. On the way back to Reykjavik we drive through the Kaldidalur desert valley, Iceland’s highest mountain track on to Þingvellir National Park which is known for it’s exceptional beauty and historical importance. 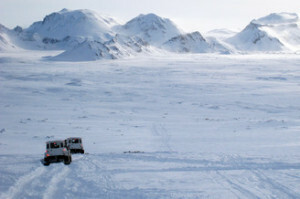 Includes Pick up from hotels/guesthouses in Reykjavik, guided super jeep tour.